This morning Carol L. Douglas sent me a link to an piece in the Bangor Daily News. And I'm thrilled to tell you that my painting, Stonington Green, was the image chosen to accompany the article on the upcoming auction to benefit the Maine Center for Coastal Fisheries. As an artist, I'm regularly asked to contribute artwork to raise money for worthy causes. Usually I'm happy to do that. And it's particularly enjoyable when the cause is near and dear to my heart. That's the case here. Formerly the East Penobscot Resource Center, the Maine Center for Coastal Fisheries has a mission "to secure a sustainable future for fisheries and fishing communities in Eastern Maine and beyond". 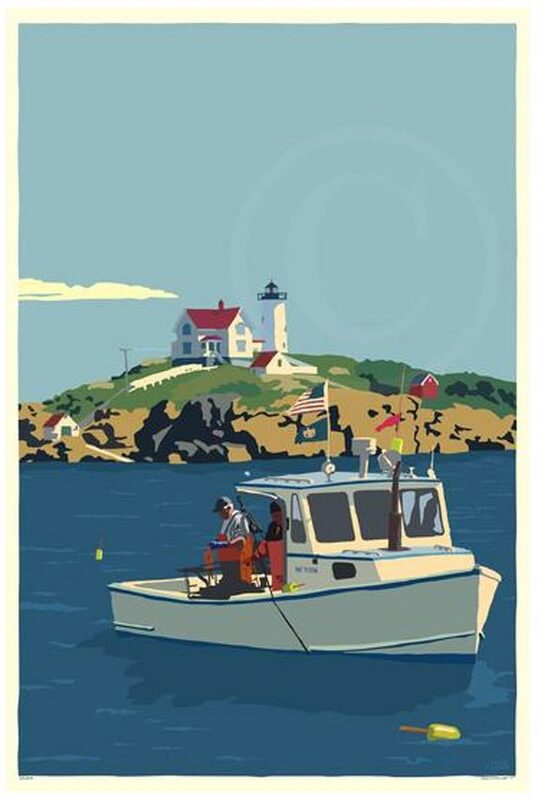 I hope that my paintings of lobstering and Maine fishing communities are documenting a way of life that will continue, and they are dedicated to that. But back to the auction. It's a very cool event. 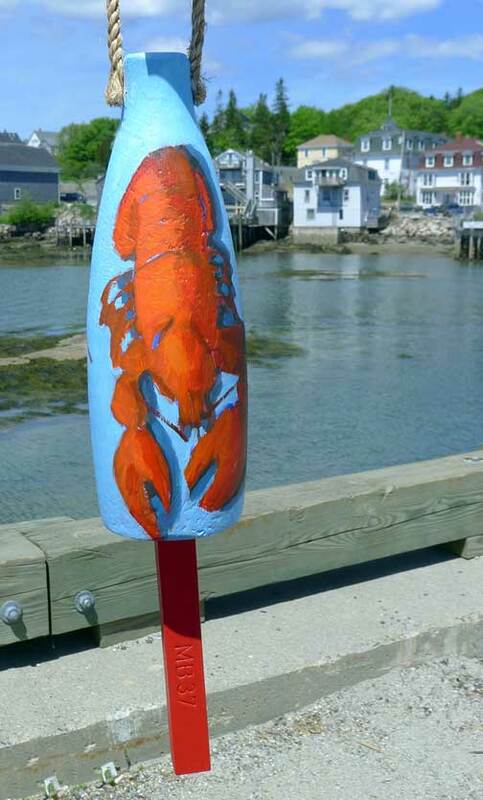 This August, in addition to their traditional decorative lobster buoys, like the one I painted last year, the auction will include paintings by some of my favorite Maine artists. And that's not all. Nautical experiences will be on the block as well. You can bid on a guided boat tour of Deer Isle-Stonington, one of the loveliest stretches of water anywhere; a course at the fabulous WoodenBoat School; a fly fishing lesson; a day on the water learning how lobstermen work; and the opportunity to be named in mystery novelist Katherine Hall Page’s next book. What a great line up! To get all the details, check out the Bangor Daily News article here. 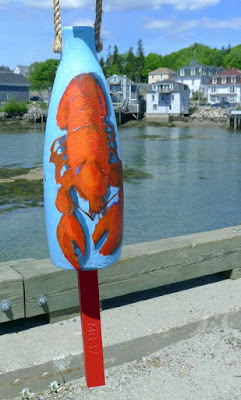 And thank you, BDN and the Maine Center for Coastal Maine Fisheries, for using my painting in your story! I’m not usually crazy about commissions, and a people portrait painter I am not. 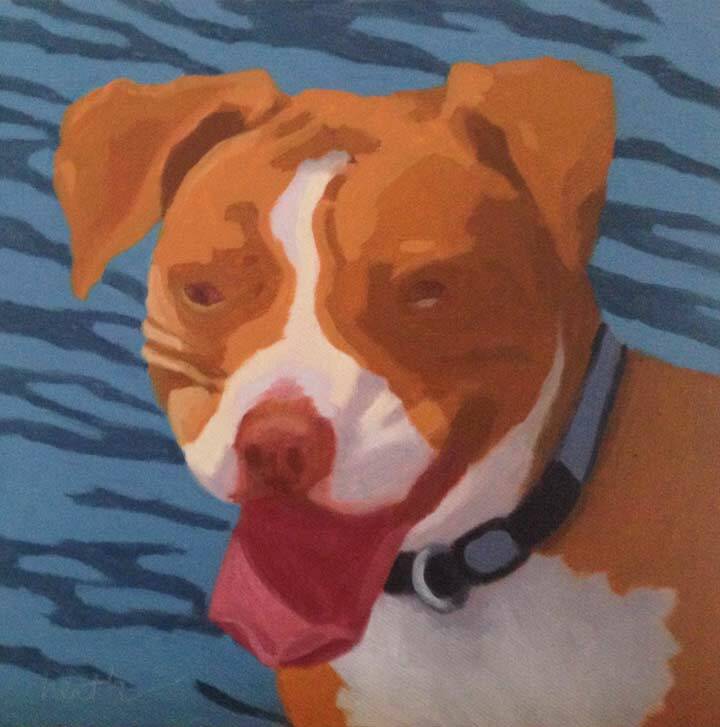 But I love to paint pets. There’s just something about animals that live with humans that is so lovable. 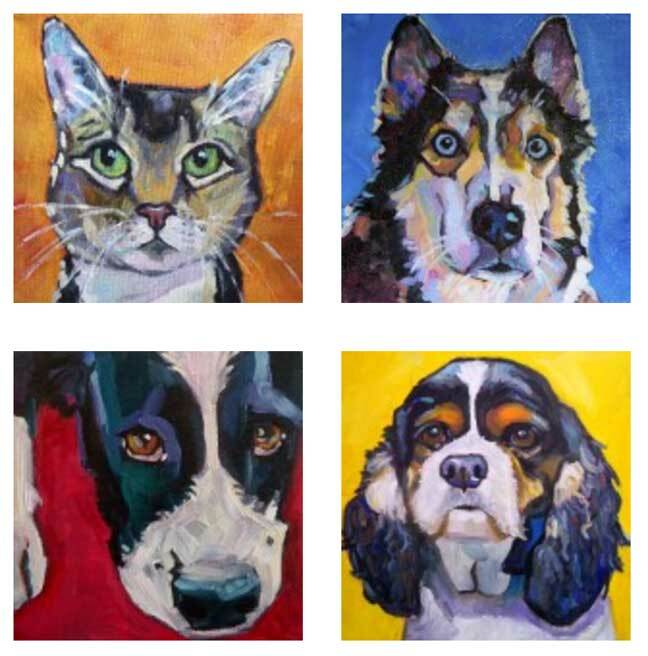 The texture and color of their fur and the distinctive varieties of their head shapes really gives me something to hang onto in the drawing and painting of their portraits. This is Troy, he’s my son’s younger rescue dog. He’s not quite two, and the most lovable guy you could ever meet. All he wants to do is play. And when it’s hot out, he droops after about a mile of walking. In the winter, the world is his snow cone. And this is Clara. She's about four, and she's the boss. Troy may tornado around and try to get her to play every minute he can, but when she says it's time to stop, he stops. She's one of the best trained dogs I've ever met, due to spending a year living with an expert trainer before my son adopted her. The two pups are quite a pair and lots of fun to have around. There are a lot of good pet portrait painters out there, but there's one that I’d like to highlight. 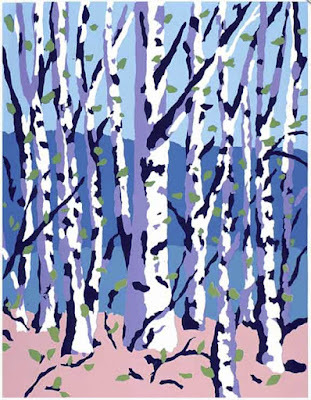 Paint Squared is the website of Elizabeth Fraser. Her pet portraits totally inspire me. 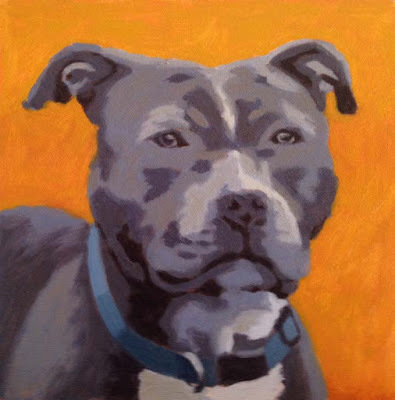 She really captures the personality of her subjects, and her color, well it’s fabulous. I interviewed Elizabeth a few years ago and it was really fun to learn more abut her and how she works. For more information about my paintings and upcoming classes and workshops, please visit my website. I've had fun painting the beach girls, and delivered four paintings of them on Tuesday to Yarmouth Frame and Gallery. You've now seen all but one. There will be an opening for the new show on Saturday from 4-7. I'm looking forward to it, since I missed the previous opening due to a snow storm. Please join us if you can. Yarmouth Frame and Gallery, 720 US One, in Yarmouth, Maine. 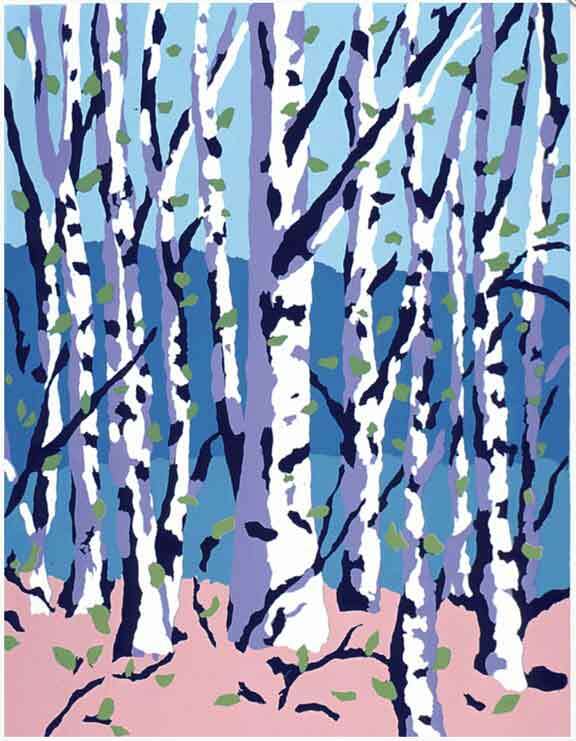 Another serigraph artist I admire is William Mitchell, who works depicts New Hampshire's scenic beauty. 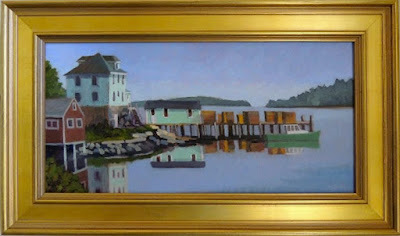 While both these artists work mostly with landscape subjects, their work still influenced mine on the four beach scenes. I wanted to abstract the shadow on the turn of the girl's legs and faces into a set of values rather than blending them into a range. Once again the restriction to a discrete set of values/colors fascinates me! I have a set of cards that I bought from William at a Button Factory Holiday event a few years ago. I doubt I'll ever send one to anyone, because I just love to look at them. 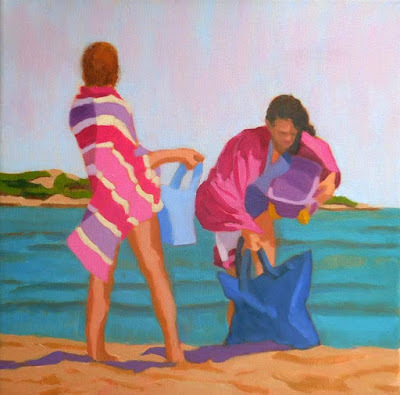 To see all of my beach girls paintings, visit my website here.